S U S TA I N A B L E L I F E spotlights seasonal recipes, shares culinary news and introduces local producers. Approximately 75 percent of MBCFM pro- ducers are located in Monterey, Santa Cruz and San Benito Counties, while others come from as far as Paso Robles, Ventura, Modesto and Sacramento. Inviting farmers from across California means consumers can purchase fresh peaches, cherries and other crops that don't thrive locally. The focus, however, always stays on foods from inside the Golden State. "You'll never see bananas and pineapples here because they're not grown in California," Barr says. "We stay true to the goal of these markets, which is for the small California farmer to bring produce direct to the consumer." 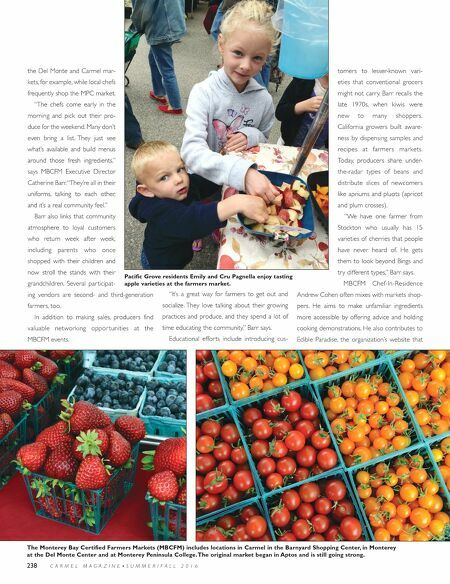 For market schedules, locations and vendor list- ings, visit the Monterey Bay Certified Farmers Markets at www.montereybayfarmers.org. MBCFM organizers also share seasonal updates, recipes and food-related news at www.edibleparadise.com. 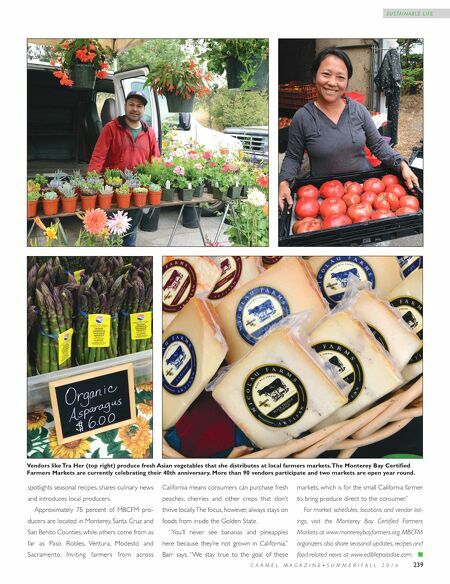 C A R M E L M A G A Z I N E • S U M M E R / F A L L 2 0 1 6 239 Vendors like Tra Her (top right) produce fresh Asian vegetables that she distributes at local farmers markets. The Monterey Bay Certified Farmers Markets are currently celebrating their 40th anniversary. More than 90 vendors participate and two markets are open year round.